Notice the small, dark opening on the front legs of this little beauty - the "ears" of the katydid. One of the real joys of nightfall in early September is the return of the katydids and their songs. Like our friend the field cricket (see Bug of the Week, August 15, 2005, The troubadour downstairs), katydids produce sound with their forewings. One wing bears a structure called the scraper that is pulled across a complementary structure called the file on the other forewing. The resultant vibrations produce the self-naming song of the katydid – katy did, katy didn't, katy did, and so on. The curved structure on the rear end of the katydid is the ovipositor used to deposit eggs on plants. As with field crickets and dog-day cicadas, it is the male katydid that does most of the singing all in an attempt to attract and woo a mate. The female katydid hears the song of the male through small openings, ears if you like, on her front legs. The sound enters through the slits and is amplified in a hornlike chamber within the leg. A membrane inside acts much like our eardrum and captures the sound. Sensory cells attached to the membrane pickup these vibrations and the female katydid's tiny brain decides if he's giving her good vibrations or not. The wings of this male bush katydid have veins like a leaf, helping it blend with the vegetation. 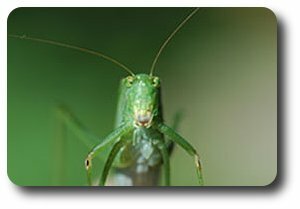 In addition to good vibrations, males of many species of katydids give their mate another type of gift, a nuptial gift, at the time of mating. This gift is a protein rich packet containing food and the sperm of the lucky katydid guy. Like all little sperm these will fertilize eggs; in this case, the dozens of eggs within the female katydid. After the sperm have entered her body, the female consumes the nutritious nuptial gift. By providing the she katydid with dinner and a date, the male may enable her to produce more or larger eggs thereby ensuring the birth of more of his own youngsters. The curved-tailed katydid bears a scimitar-like ovipositor on her rear end. This ovipositor is used to deposit flat, oval eggs in rows on plants. The eggs endure the winter when cold temperatures and lack of food make it impossible for plant-eating nymphs and adults to survive in places like Maryland. Katydids are also masters of disguise. If you look carefully at their wings, you will notice the delicate network of veins closely resembling the veins of a leaf. This deception and their green coloration surely help them avoid detection by birds and other hungry predators that would find them a tasty treat.